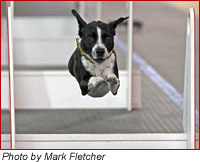 Specifications for flyball jumps and boxes used in competition can be found in the NAFA Rulebook. Custom team shirts, signs, banners, license plates, etc. "The SpringBack Hybred" flyball box. Also a private business for machine shop Flyball stuff. Flyball tugs, and more to come! Team shirts/uniforms and dog sport t-shirts. Team uniforms any color in a large selection of designs with your logo and/or name. Specializing in Embroidered Team Flyball Wear, Embroidered Team Jackets, Judges Shirts, and Fun Flyball Apparel. "Leg armor for gonzo dogs!" 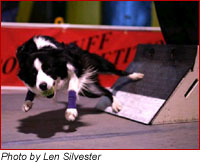 Contact Jenny Blank about Tuff-Spun mats, she has lots of experience dealing with flyball folks. Tournament-quality mats are generally sold in 60' x 3' rolls, and are 3/8" thick. Many teams prefer the ribbed mats in either gray or black. They are approximately 110 lbs per 60' roll. © 2016 North American Flyball Association. NAFA® is a registered trademark of NAFA, Inc.